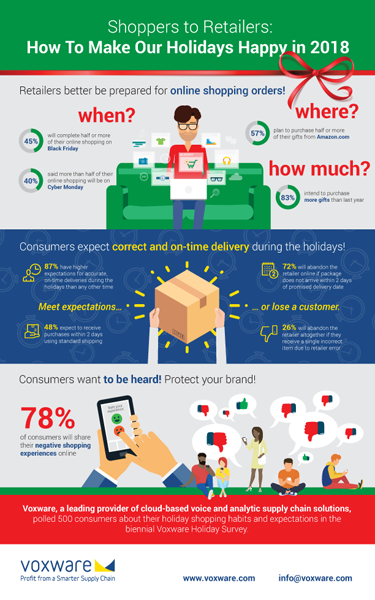 Fourth biennial holiday shopping survey reveals 48% of consumers expect holiday purchases to arrive within two days. Hamilton, NJ, November 13, 2018 – Voxware, a leading provider of cloud-based voice and analytic supply chain solutions, today announced the results from its fourth biennial holiday shopping survey. Retailers will be eager to learn that 83% of consumers intend to purchase more gifts in 2018 than they did the previous year. However, consumer expectations are even higher this year as well.